Coppyright Kinki University All Rights Reserved. The Kinki University Fisheries Laboratory, restaurants serving farmed fish that was opened by Kinki University, became the world's first "Gold Sustainability Partner" in November 7, 2013. The award is given by Sailors for the Sea Japan to restaurants that are contributing to marine environmental protection. 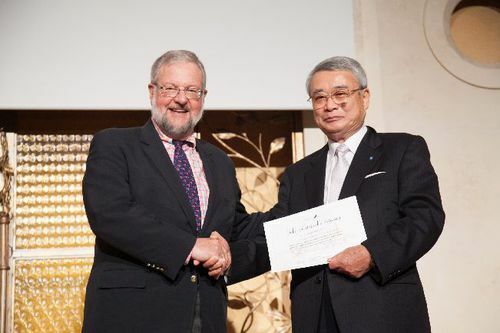 Sailors for the Sea Japan is part of Sailors for the Sea, a U.S. not-for-profit organization founded by David Rockefeller, Jr., chairman of the Rockefeller Foundation. Their mission is to educate the boating community in protecting the marine environment. The Kinki University Fisheries Laboratory is famous for its bluefin tuna brand, "Kindai Maguro." It is also the first institution in the world to succeed in fully cultivating various fish species such as flounder, yellowtail, great amberjack, and longtooth grouper. The restaurant has received favorable reviews as a place where general consumers can enjoy eating farmed fish. It opened its second restaurant in the Ginza district of Tokyo in December 2013.